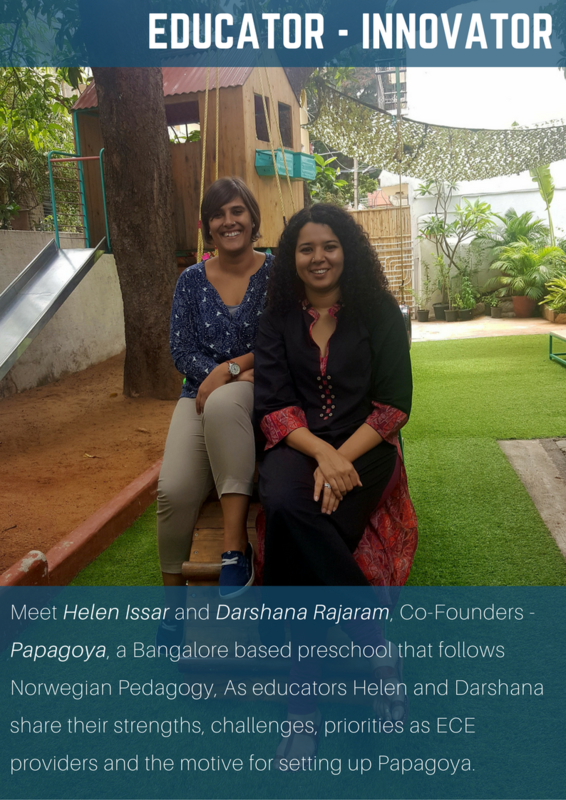 The Educator Development Academy will be featuring innovative ideas in early childhood education in a series called “Educator-Innovator.” Our first interview of the series is with Helen and Darshana, co-founders of Papagoya in Bangalore. What made you set up Papagoya? What gap did you think you were filling at that point of time? As founders we have had the privilege to live, work and study in Norway and be exposed to a very progressive Scandinavian way of life where women represent 40% of all Board seats, men take pride in going on Paternity Leave and toddlers grow to be secure, confident, independent and gentle little people. And the common thread that results in such a fulfilling life is the Norwegian Kindergarten. And so we thought, why can’t this be so, even in India? Papagoya is our endeavour to create a safe and welcoming environment for children where they are met with the recognition and respect for who they truly are. It is our space where we can appreciate the intrinsic value of childhood. This is our effort at supporting working parents and particularly mothers, to pursue their ambitions and passions. Where we hope to encourage true gender equality and see more involved fathers. Papagoya is our long-term dream to influence early childhood practices in India. This is our way of making an impact, by creating an ecosystem that supports the new Indian parent and child. Please give an overview of Papagoya’s key features and strengths. From all the models we evaluated that were present in the early years, there were a few reasons that made us go with the Norwegian Pedagogy. Relevance: The Norwegian Pedagogy and Framework plan is constantly adapting itself to the environment around. This makes the overall approach to education very relevant to today’s needs and prepares children for the way the world is and will be tomorrow, both from a skills perspective but also the kind of human beings we want them to be. 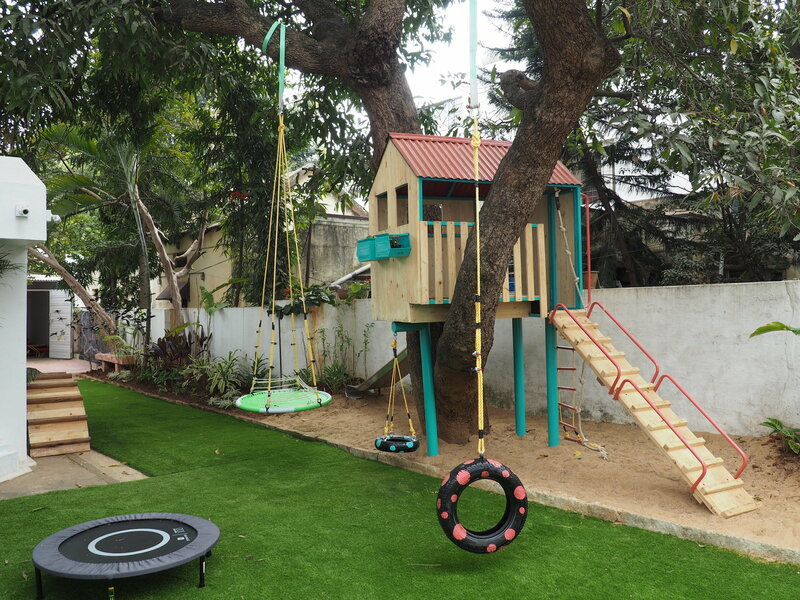 Play-based outdoor approach: With shrinking lung spaces in urban India and children being made to sit in classrooms more, we loved the more practical approach of being play-based and giving children more opportunities to be in the outdoors. With the adult to child ratios being 1:3 for the under 3 year olds and 1:5 for 3-6 year olds, it is now possible to ensure learning via play, as educators have the time and bandwidth to ensure interventions during play, and find learning opportunities again through play. Enabling women to pursue their careers via our full day Kindergarten: Indian women are more educated today, and hence more passionate about pursuing their careers. And yet, their workforce participation rate is only at 15% with 48% of women dropping out mid-career. Papagoya’s full day program not only encourages women to stay in their careers, but we also become a strong support to parents, as children come to us from the day they turn 1 year old. India’s parents commonly send their children to Kindergarten for a couple hours. Full day solutions come only in the form of day cares. We found parents extremely anxious to put their children in a full day Kindergarten where care, play and learning are seamlessly integrated into the way the day runs. With advice from our sister Kindergarten in Norway, we allowed parents, for a limited period of time, to do a half day program, knowing that in all cases the child will often be the one who initiates wanting to stay the whole day. This is exactly how it’s worked out in every case. It is testimony to the Norwegian approach and understanding of the Early Years, what is important for and to a child and what excites them in their developmental process. What are the most important components that add to high-quality preschool education? (e.g. teacher training, infrastructure, curriculum, assessment, etc.) Please define your priorities as an ECCE service provider. Relevancy in curriculum and the impact on child evaluations : We find curriculum’s the world over need to adapt to the way the world is changing and the skills children need to navigate the world. This directly also impacts how children are evaluated on the skills they build as they grow. Many curriculums even in the ECCE space have not been changed in 20-30 years or more. Educator to Child Ratio: When educator to child ratios are high, we are able to engage every child in a way that matches their natural ability, interest and pace of learning, while encouraging them to keep their individuality. This also allows us to pick up on verbal and non-verbal cues and provide every child with the care, comfort, cuddles, meaningful play experiences and learning opportunities as they need. Teacher Training: Our base requirement of any teacher is in their ability to be gentle and empathetic with children and to be with children because there is no place they’d rather be. Every curriculum comes with a deep methology that requires constant training for educators. We currently do this via visiting educators from Norway. Transparency in Communication with parents: When it comes to the early years, collaboration between the home and the Kindergarten is absolutely vital. Being transparent in our communication to the parents and vice-versa is always to the benefit of the child and allows both of us to always ensure that the child is at the center of all we do. Helen Issar and Darshana Rajaram are co-founders in this endeavor, with a strong Norwegian connection. Helen lived and worked in Oslo for 4 years and Darshana has family in Oslo and an MBA from BI Norwegian Business School. Both Helen and Darshana have combined experience of over 30 years’ in navigating the Indian/Asian business environment. Born and raised in Bangalore, they leverage their extensive local and Norwegian network to make Papagoya come alive. Helen has over 12 years of experience across the Education, F&B, Retail, Media and Technology Industries in Sales & Marketing, Product Management and Digital Marketing roles. Having lived in Norway, Sweden and Denmark, she witnessed how the Norwegian Barnehage program allowed women to get back to work and ensure a complete development for their children. Helen is a serial entrepreneur and Papagoya is her 3rd venture with a strong women-focused agenda. She is the mother to an animal-loving energetic toddler, wife to a successful tech entrepreneur, thespian and a master baker of delicious goodies. Papagoya is the marrying of her long term passion to work with children and her understanding of the support a woman needs to be able to don the hats of career woman, mother and wife. Darshana spent over 16 years in the complex world of Logistics & Supply Chain, Military & Defense Logistics, Maritime and Oil & Gas Industries in Strategic Account Management, Corporate Development and PMO Functions. She has lived, worked and studied in Canada, Belgium, Norway and Singapore. Darshana has an MBA from the BI Norwegian Business School in Norway and Nanyang Business School in Singapore. She is a travel enthusiast who has immersed herself in over 60 countries, and a qualified rescue diver who has also represented India in International Swimming. 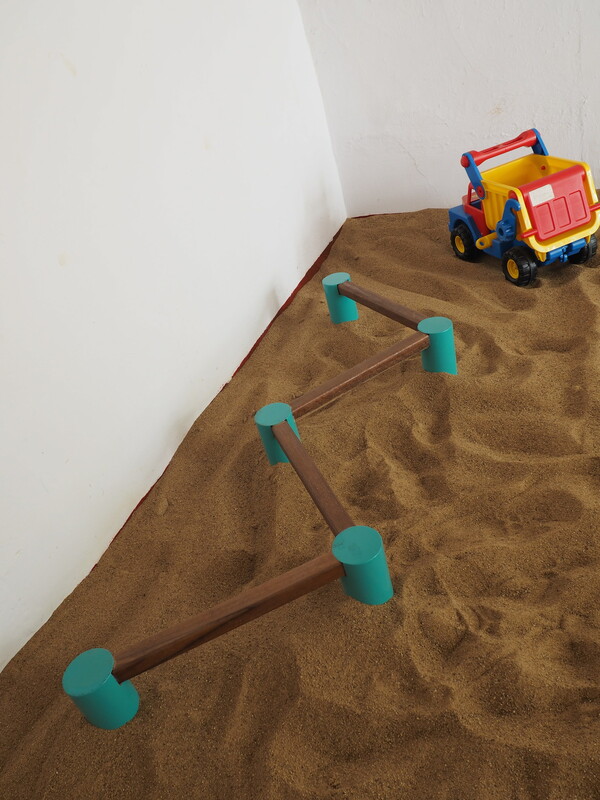 Papagoya is her quest at creating a meaningful world for toddlers and adults alike.